Winners of the annual Wallace McCain Institute Growth Awards recognize some of the Atlantic region’s most accomplished business leaders for significant success in expanding their companies over the past 12 months. This year, the awards celebrated companies that grew in various ways: organically through expanding their geographical service footprint in Atlantic Canada, increasing material sales instead of only labour, expanding to deliver services from local to across a province, and by making multiple acquisitions across Atlantic Canada. Whether by acquisition, geographic expansion or a re-focusing on the product/service mix, these winning entrepreneurs from Fredericton, Charlottetown and Bathurst are stellar examples of success. Together with the nine other finalists for the Growth Awards, the 12 firms added 660 jobs to the “Greater Atlantic Area.” “By recognizing our members who are achieving significant growth, they can celebrate together and inspire each other to push harder,” says Nancy Mathis, executive director of the Wallace McCain Institute at the University of New Brunswick. 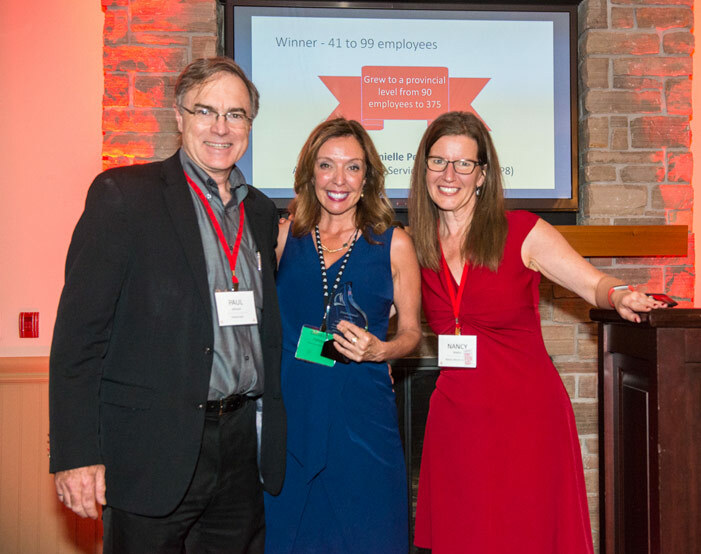 Danielle Pelletier of Fredericton took home the prize for the 41-to-99 employee division. Ms. Pelletier is the CEO of Autism Intervention Services, a company based in Fredericton, which expanded operations last year to cover all of New Brunswick. With new offices in Saint John, Moncton, Beresford, and Edmundston, the employee base grew by a factor of four. “With this rapid growth in employees, we are always on the lookout for new talent,” says Ms. Pelletier. "Along with the expansion, came the resources to ensure that the same level of high intervention quality is being maintained throughout the province." Sebastien Pitre, president of V. Pitre Fondation in Bathurst, won in the 10-to-40 employee category for doubling revenue. “We improved dramatically in the last year because we sold more material than in the previous year,” says Mr. Pitre. Steven Jackson, CEO of Sperra Construction of Charlottetown, won in the under-10 employee category. “We have focused on more projects across Atlantic Canada this year, and it has paid off,” says Mr. Jackson. “Sales have tripled!” A cash prize was awarded to the group with the combined largest growth. With three individual prizes going to members from the same peer group, it was no surprise when the eighth cohort of the Entrepreneurial Leaders Program (ELP8) was announced as the winner. Together the group grew its combined revenue by $40M. The prize is a $5,000 grant to be used to support the cost of the speakers that the cohort involves in its quarterly retreats. “As co-moderator of ELP8, I am incredibly proud of our members for their individual accomplishments,” said Michael Van Meekeren of Van Meekeren Farms in Kentville, N.S. “Watching them grow this year has inspired and fuelled the other 13 entrepreneurs in our group.” The final prize of the evening was more personal in nature. The prize, called the Carpe Diem Award, was started in 2015 in recognition of a member of the institute, Patrick Albert, CEO of MQM in Tracadie-Sheila, who died tragically earlier that year. His personal motto was “carpe diem” – Latin for “seize the day.” The award was based on member nominations, and then voting on 12 finalists based on their embodiment of the mission statement for Mr. Patrick’s ELP forum “to embrace our leadership responsibility to build a Greater Atlantic Area and live our one life with passion.” The award went to Greg Hemmings, CEO of Hemmings House Pictures in Saint John. “I am touched to be recognized in memory of Patrick,” Mr. Hemmings says. “I am inspired to keep living carpe diem as hard as I can in memory of him.” About the Wallace McCain Institute The focus of the Wallace McCain Institute at the University of New Brunswick is to support the next generation of senior business leaders in the Greater Atlantic Area (GAA). The Institute is a catalyst for shifting the business culture of the region and advancing the values of entrepreneurship. The development of deep relationships and networks is fundamental to how the Institute delivers on its mandate. Programs include intensive cohort programs where participants interact in a retreat environment for our region's business leaders (ELP), the Second-in-Commands (2iC) as well as a program focused on multi-generational businesses (ECHO). The Institute also offers elite workshops and special events on themes relevant to entrepreneurs while also using its broad network of business leaders to give back to the start-up community through its Dine & Dive program. The Institute uses innovative approaches to convene people, share best practices, enrich learning, and inspire change. Media contact: Nancy Mathis, Executive Director of the Wallace McCain Institute, cell (506) 721-3820, nancy.mathis@wallacemccaininstitute.com Tag us in your Twitter posts: @WMInstitute Photo: Paul Johnson, Executive in Residence of WMI, Danielle Pelletier, Award Winner, CEO of Autism Intervention Services and Nancy Mathis, executive director of WMI.